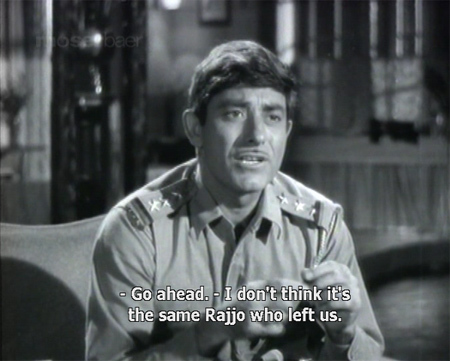 Widower Chandrakant (Ashok Kumar) is a blind retired Army Major with two sons: Shri (Raaj Kumar) and Rajjo (Feroz Khan). The Major is a proud man who doesn’t let his blindness stop him from seeing much, and he commands great respect in Ooty, where they live. Shri is an upright, rigidly honest police inspector. Rajjo has just finished college, and is handsome, charming and clearly spoiled. The story begins as Rajjo arrives home, to the great joy of his family and their long-time servant Juman (Kumud Tripathi). But Shri sees some changes in his little brother that trouble him. Juman is more a member of the family than a servant, although in the afternoon the Major gives him three lashes after he inadvertently insults a guest (thereby blotting the Major’s honor). A disapproving witness, Shri reminds the Major that nowadays he could be arrested for beating even a servant. Juman himself doesn’t seem to mind much, and later when the Major gives him 50 rupees because he’s feeling bad about the incident, Juman shows it to Shri saying: “You wanted to deprive me of this.” It’s one of many instances where the generation gap between Shri and his father are highlighted, despite their great similarities in character. That evening Rajjo abruptly scolds Juman for not having made up his bed yet. 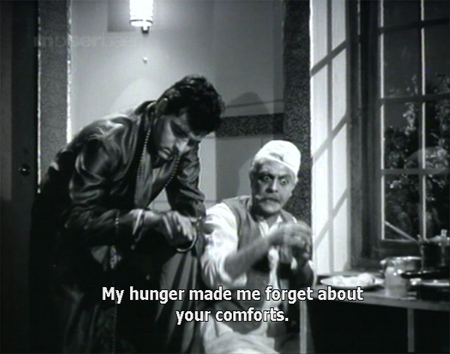 As Juman leaves his dinner and scurries upstairs to take care of it, the Major gently reprimands Rajjo for treating his “uncle” that way and tells him to apologize to Juman. Rajjo does so, and all is forgiven although I’m not sure why the Major was okay with his own whipping of Juman, but not with Rajjo’s rudeness. He definitely is channeling Shammi, too! 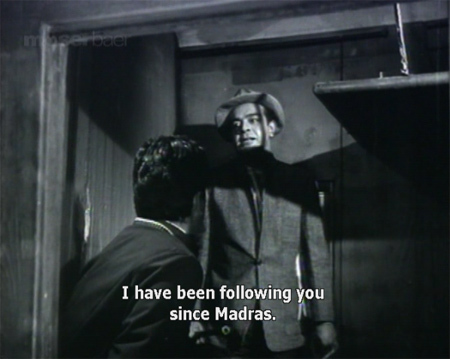 The next morning he tells Shri and his father that his friends want to meet him for a holiday in Kodaikanal. They refuse, but encourage him to go. Off he goes to romance Bimla. One of the interesting things about this movie is that there are only two women actually seen in it, and they are extremely peripheral with hardly any screen time. One of them is the wife of the Major’s friend Gunichand, the local schoolmaster, who wants to get his daughter Pallavi (who is never seen) engaged to Rajjo. She (the wife) is a harridan who sets their dog on her poor husband. Naturally I have to screencap the dog. The other is Bimla herself (KR Vijaya). When Rajjo meets her in Kodaikanal they sing a pretty duet—“Aaja Re Mere Pyar”—but she is mostly hidden from us; we see her only behind things, from a distance, or in profile, but very rarely (if ever) a full face. I am not complaining about it, but it’s very odd and I’m not sure if there’s supposed to be a message there that I missed. Great pains are taken to keep her mostly hidden. Perhaps it’s meant as a symbolic statement about the status of women in India! His father has all but promised Gunichand that Rajjo will marry Pallavi, and they are looking for an auspicious date. One day a letter arrives addressed to “Shri Kant”. Shri reads it but it’s a letter for Rajjo from Bimla, who is pregnant, and desperate for Rajjo to come and marry her before her brother finds out. 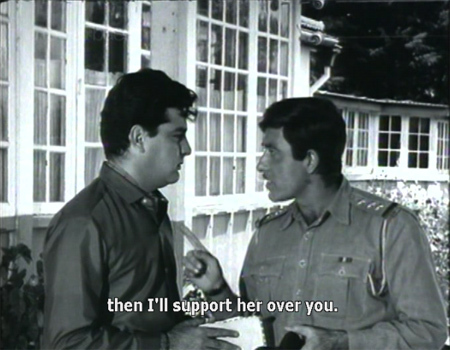 When Shri confronts Rajjo about it, Rajjo attempts to wriggle out of it. Cad! Upset and angry, Shri tells Rajjo to go and do the right thing by Bimla and bring her home as his bride. Yay Shri! Rajjo does go to see her, but reluctantly—and he steals a thousand rupees from his father on his way out. After he leaves, a telegram from Bimla arrives and the Major receives it. Shri covers up for Rajjo, both about Bimla’s situation and when the Major discovers that his money is missing. On the train to Kodai, an old man and his son sing a song: “Kaisi Tune Reet Rachi” as Rajjo sits in his seat and counts the stolen money. I’m reminded once again of my tendency to forget that the Indian viewpoint can be quite different from mine! Anyway, Rajjo meets Bimla and explains to her that he has to speak with his father before he can marry her. She understands clearly that he’s too weak and self-serving to do the right thing by her. During this scene we only see her from behind as she weeps bitterly and tells him to get out. 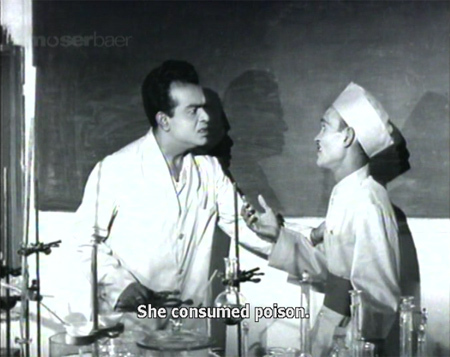 Later at his lab, her scientist brother (a very young Tarun Bose) receives a phone call—his sister is dead. She has left behind a note explaining everything. Her brother rushes to the hostel to see Rajjo, who has just left to catch the train home. 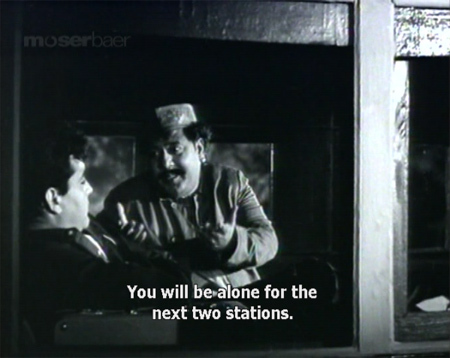 On the train, Rajjo shares a compartment with a talkative fat man (is there any other kind of train passenger in Hindi cinema?) until he reaches his station. But he is not alone; another passenger enters the compartment as the train pulls away. It’s poor Bimla’s brother, and he is in a rage. What happens next? Will he avenge his sister’s death? Will the Major and Shri find out what Rajjo has done? The story from here takes some unexpected twists and turns. Do watch it to find out what happens; it’s a very well-done film and well worth a few hours of your time. All three main characters are beautifully fleshed out (director Phani Majumdar also wrote the screenplay) and the actors bring them to vivid life. It’s not a happy tale, but it is so nicely handled on all fronts that you are drawn in. There is no black or white here, only shades of gray. 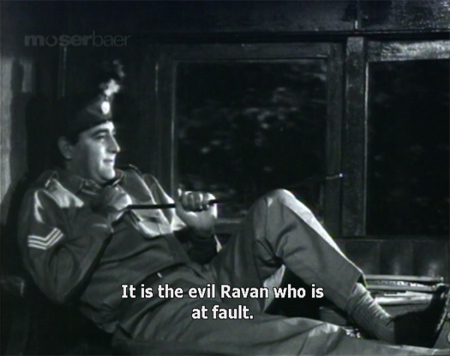 Feroz Khan as Rajjo gives a brilliant performance—you cannot totally dislike Rajjo, no matter how selfish he is or how poor his choices. It’s easy to see why his father and brother have indulged him. Oonche Log also reminded me a little bit of the fantastic 1939 George Cukor movie The Women. That film had no men in it, although their presence in the lives of the women onscreen was palpable. In this too, although the women were given little or no screen time, they were very present: the Major’s beloved wife, tragically mistreated Bimla, the bahu-to-be Pallavi. But it is the values and concerns of the father and his sons which are at the heart of the film. If you are a fan of any of the three central actors, don’t miss it. Posted on May 4, 2009 at 2:14 pm in Hindi movies	| RSS feed You can skip to the end and leave a reply. I’m not telling!!! Feroz is v.v. cute although naughty. I hadnt even heard about it till a few days ago until I got down to write an article on FK. It’s a very good movie, I thoroughly enjoyed it. Very nicely done Memsaab! 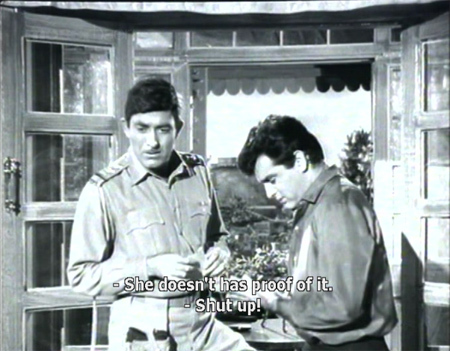 I’ll have to go into the bother of seeing it now, you’ve made it sound so interesting :-) And Raaj Kumar looks GOOD! Ha! That means I’ll have to send it back to you! 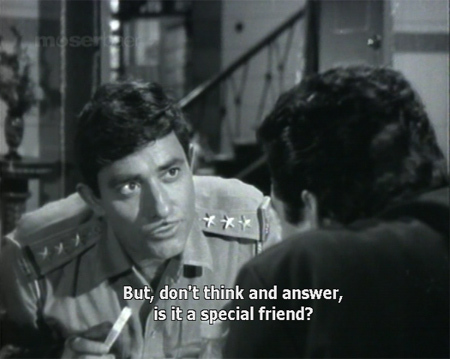 :-) Raaj Kumar was really great in this. I liked his character, and he was less, um, theatrical than he can be sometimes. And Dadamoni was awesome too. You’ll have to watch :-) Yes, it was pretty much a female-free film! I absolutely adore all these songs, had no idea they were from this film. I have also heard a lot about Oonche Log, but never got around to watching it. Thanks for writing about it. It was fab as ever. Yes, the songs are just gorgeous. I had not ever heard them, but went and got them as soon as the film was over! Thanks Southie! I actually felt a little bad about this one—I don’t think the review does the film justice. It is a “not to miss” one. Sounds like a good watch. 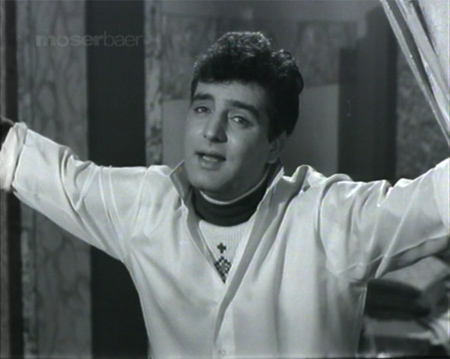 I watched ‘Safar’ yesterday, and was surprised at how well Feroz Khan held up against Rajesh Khanna and Sharmila Tagore. Somehow, I’ve always remembered him in his more flamboyant roles. I’ve got to see this; it sounds very good. 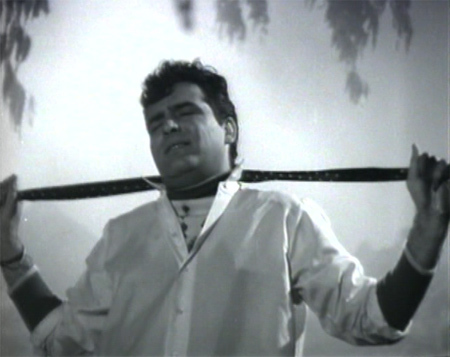 Just the other day, I was discussing with one of my readers how so many Bengali directors (Hrishikesh Mukherjee, Asit Sen, Bimal Roy, etc) tend to create films and characters in shades of grey, not sharply delineated black and white… now I must add Phani Majumdar to that list. Yes, from what you’ve written, it does sound similar to The Women – I must see that again; it was a great film too! Actually this movie is based on a play by legendary Tamil filmmaker K. Balachander (1930-2014). I haven’t seen the play, but the makers of Oonche Log seem to have made a conscious attempt to stay faithful to the original- the names of the characters are unchanged. Balachander himself made the movie in Tamil in 1966. Haven’t seen Oonche Log, but I can testify that the movie (Major Chandrakanth- the title of the play as well) is a classic. As a footnote, Rajjo’s full name is Rajnikant. K Balachander would give that name to a promising youngster called Shivaji Rao Gaikwad while launching him in a movie called Apoorva Raagangal a decade later (that movie is one of the landmarks of Tamil cinema). That young actor did pretty well for himself one must say! This movie was based on a powerful Tamil language play called “Major Chandrakanth”. Of course, I know this from the feedback that I received from my readers when I posted songs from this movie. Even I noticed that the females in this movie were as elusive as the bigfoot or the Yeti, even when it was a song being sung by a female. Yes, the play was credited at the beginning. I am falling off my chair laughing at the “elusive as the bigfoot or the Yeti” :-D So true! 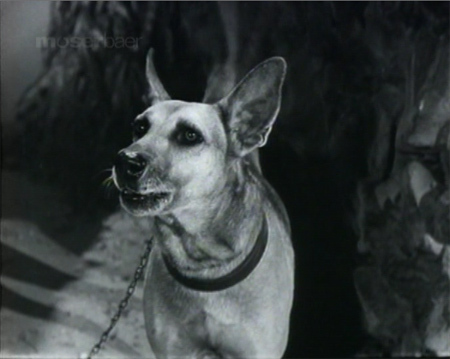 The play was adapted by the playright into a movie which released one year AFTER the Hindi adaptation. The Tamil movie (same title as the play) featured only 1 woman character- Vimala (played by later day CM of Tamil Nadu Jayalalitha). As it happens, she had a pretty substantial role in the movie. Apparently the scriptwriter snipped off her role in Hindi! The heroine of this movie is called K. R.Vijaya. It was her debut movie in Bollywood. She is apparently a well known name in Tamil movie industry. Thanks, I’ve updated the post :-) I wonder how she felt about being virtually invisible in her Hindi film debut!!! Kanyadaan was Phani Majumdar??! And Kaajal? I take back my words. Both films, frankly, despite having great music and some people I like a lot, were otherwise pretty avoidable. Asha Parekh in the second half of Kanyadaan was just as weepy as Meena Kumari – set my teeth on edge. That’s according to imdb, which is not always accurate although I think it probably is in this case…I was familiar with his name and can’t think how else that might have happened :) But this one makes up for the others! There is no black or white here, only shades of gray. Loved this movie when I saw it a few years ago. Like Atul says, it is based on a Tamil play “Major Chandrakanth”. That probably also explains the sets. I thought all of them put up a powerful performance. The songs are lovely too. This movie is a “must-watch” for anybody who wants to see a different type of Hindi movie. The actor who played the Major in the Tamil play and movie was thereafter referred to as `Major’ Sundarrajan, my father told me. Oh I just watched this movie, and the climax is amazing. It is such a controlled movie, which many movies are not. And the whipping is explained so well in the first half, the Major will whip anyone, even his own son, for deviating from his ideals of ‘good conduct’. I found Raja’s comments useful too, the movie does have a ‘drama set’ kind of a feel. I presume in the drama there were only male characters and the women were just referenced through dialogue. I guess even the few digressions of moving-out-of-the-house scenes were a concession to the movie-medium. Thanks to Memsaab and Raja whose write ups made me appreciate the movie more. I had seen and liked this ages ago, but had forgotten about FK being the other hero! Wish there were more films like this one: well-made, with a story to tell. Oonche Log seems to be a good film. Could you solve the mystery of the hidden women? I’ve always heard of Phani Majumdar but never seen a film of his. Didn’t he act as well? I think that the fil was shot in b/w helps the drama of the film. Thanks for bringing the film to our notice, till now I’d just heard its name. Memsaab, you deserved serious kudos from a complete fan of the film. 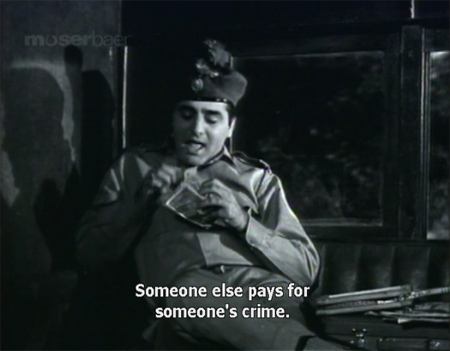 Feroz Khan was an underrated actor and stood his ground in this film. But the film itself is a tiny, underrated classic. 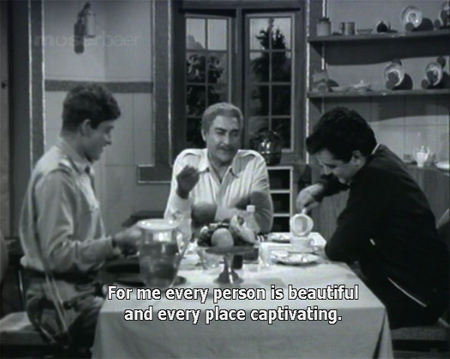 It shows not only the gradual passage of time and its values and systems (beating the servant), but also is unique in Hindi cinema in showing the relationship dynamic between the father and the sons. Rajkumar and his father Ashok Kumar sit and have a drink and smoke with each other and live a fairly westernised life (the father’s dressing gowns!) no doubt because they are in the army/police. Films in those days showed heroes who never smoked and were pure as the driven snow; In any other film a man like Khan would have been the villain. Memsaab, thanks once again and I look forward to reading more by you. I watched this movie today. I watched only second half and i was searching the name and i came across this website. I found this movie to good and a must watch. When feroz khan passed away, my maussa(uncle) mentioned this movie to movie.Can you name a few movies like this–teaching some lessons and emotional dramas. My taste is Namaste London, Guru,Chak de, Guide, Kroadhi,Lagaan, Apne. I stumbled upon this review while doing a google search on my father the late Tarun Bose. It brought back fond memories of my childhood. Some portions of the film were shot in Ooty. It was while shooting for this film that my father discovered that Raaj Kumar wore a wig. I would like to point out an error– Juman is played by Kumud Tripathi & not Kanhaiyalal. The latter played another role. Major Chandrakant was originally a play with only male actors which explains why the female character is almost non-existent. I just saw your father’s first film (?) (the credits anyway said “introducing Tarun Bose”) and reviewed it, Apradhi Kaun! :) You must have some great stories and memories, thanks so much for stopping by! Yes Apradhi Kaun was his first film. The manner in which he was discovered by Bimal Roy makes for an interesting story. Oooh! Do you feel like sharing? :D We love stories like that here! Don’t know if I shall get any response to this. This movie was K R Vijaya’s first and last Hindi movie.She did not know Hindi and was from the temple town ‘Pazhani’ in Tamil Nadu (near Coimbatore).Allegedly, she was selling flowers outside the temple when she was spotted by film fraternity and zoomed to great glory in Tamil movies.She was introduced by the late Gemini Ganeshan (actress Rekha’s dad).She was very famous for her smile and has acted in almost all South Indian movies – just like Waheeda Rehman, she still keeps acting in that occasional movie! She is married to businessman Velayutham and is one of the few actresses whose marital life was blissful.She also made it a point not to let her only daughter act in movies and made sure that her daughter was married off after her studies. Memsaab, you may not know that this movie was made into a Tamil movie also titled – Major Chandrakant. It was released in 1968. The role played by Tarun Bose was enacted by Tamil actor Nagesh and do you know who played Bimala in the Tamil movie – it was Jayalalitha. Unlike the Hindi movie, Jayalalitha had a fairly prominent role and in the Tamil version, the brother of Vimala is a tailor who is very fond of his sister. The movie was directed by K Balachander [of Ek Duuje Ke Liye fame]. The movie is remembered till today for the famous dialogues. A classic movie ! It was one of Jayalalitha’s most underrated performance – she is a good actress who never got her due in Tamil movies….There is one dialogue in the movie that subtly indicates that Bimala has lost her virginity – she tells her brother – “The milk has got curdled” implying that she has been seduced by her evil boyfriend.Feroz Khan’s role was enacted by AVM Rajan and Dadamoni’s character was played by Sundarrajan. The movie became such a rollicking hit that Sundarrajan was always known as ‘Major Sundarrajan’. It’s too bad we could see so little of her, because she did seem quite lovely in the small glimpses we did get :) thanks for all the info—would be fun to see the Tamil version some day! Cant wait to watch this film. hope i will be able to find it online. thanks for the review. I have seen this wonderful movie in year 1965 itself.I wonder still, why full exopsure and close up shots were denied to Bimla in the famous duet song where as FK was given closeup shots.Bimla looked very pretty and beautiful in even in glimpses.Her personality was slim and attractive.She was pretty looking also.I would have loved to see her in in any other hindi film also.Dubbing of dialogues could have been done in case of language difficluty.Directot Phani Majumdar was the best but deprived Vijya full front view.Same Tarun Bose was the main villian of GUMNAM, a suspense thriller film of the same year 1965.Memorable movie. I used to tell my engineering students full story of this film as I felt it to be best movie I have ever seen in hindi cinema.What a plot and what an end. It is good that character of Ferozekhan i.e. Rajnikant was terminated abruptly before interval by murdering FK in the train.He was acting , rather overacting.He could not have retained before the real jewel acting by three veterans i.e. Ashokkumar, Raajkumar and Tarun Bose.All the three made later half of the movie absolutely thrilling in every scene. Pin drop silence was there in the theotre when final drama was unfolding.Any layman can not handle the revolver perfectly as handled by a police officer like RAAJKUMAR in the final scene.Rebuking of Inspector son Raajkumar by father Ashokkumar by lashing in the last scene was excellent and was a perfect climax justifying the title of the film.Even villain Tarun Bose was left astonished by the super act of Ashokkumar.Ultimately there was a true Takkar of talents in which Ashokkumar finally shown his class of acting . That is the reason why we call him DADAMUNI. If I remember and not mistaken, I have seen Tarun Bose in 1955 Rajkapoor’s film Shri 420 in a sequence in market with Lalita Pawar.Song was Ramaiya Wata Waiya. Am I correct, some senior should certify. Gotya, I just saw your comment, my father(Tarun Bose) did not act in Shree 420. Thanks,Miss Shilpi Bose.You are the first from film world to reply.Thanks for your information. Your father, Late Tarun Bose was really a veteran and genius actor of his times.I liked his acting in Anupama. He acted superbly in GUMNAM in final drama showing the frustration and hence vengeance of a deceived man. Other bangali actress, I likes is Aparna Sen.Senior actors from west bangal in Hindi films are also very talented.For example, Abhibhattacharya, Asit Sen, comedian ,Uttamkumr ,Vishwajit and Pahadi Sanyal. In new generation, I like Mithun. Sharmila, Jaya bhaduri and Rakhee are my favorites from Bangal. My real name is Dr Satish Chandekar, Phd in Electrical Engineering and I am working as Professor and vice-principal of Priyadarshini college of E ngineering, Nagpur, MAHARASHTRA.My daughter is married to Bangali and she lives in Lake town in Kolkata. I have made a detailed study of hindi film songs, music and films from year 1955 to 1980.I like music directors Salil Choudhary, Hemantkumar , Chitragupta and SD, RD etc. I often conduct Filmy Quiz in my college.Do reply to my other queries. I wrote to you as GOTYA before. I would have to say they don’t make films and dialogues like this movie any more!!! It is a critically acclaimed film of its time and went on to win awards as well.Happened to first see it on Door Darshan, India’s official TV channel, in 1970s when movie-watching on DD was with family was a weekly ritual for all. When I was in Bangalore in early 1970s, I had learnt that KR Vijaya had a bigger role in the film, but there were two problems with her. As she was a busy superstar, working overtime in all the South Indian language films, she had lot of trouble giving with dates for Oonche Log. Besides, as she hardly knew Hindi, she could not devote much time to learning the dialogues or lyrics of the songs. That’s why her role was cut drastically cut and most of her shots were either from the back or the face was obscured, especially during the beautiful song Aaja re… Luckily the story of the film was such that her truncated role hardly made a difference and may well have been a blessing in disguise.